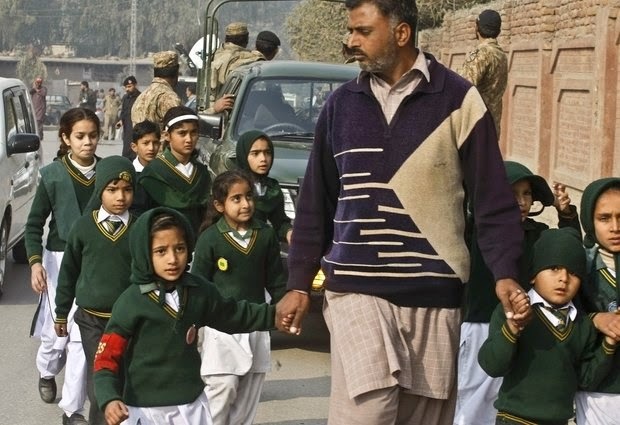 A plainclothes security officer escorts students evacuated from a school as Taliban fighters attack another school nearby in Peshawar, Pakistan, Tuesday, Dec. 16, 2014. Taliban gunmen stormed a military-run school in the northwestern Pakistani city, killing and wounding scores, officials said, in the worst attack to hit the country in over a year. PESHAWAR, PAKISTAN (AP) — In the deadliest slaughter of innocents in Pakistan in years, Taliban gunmen attacked a military-run school Tuesday and killed 141 people — almost all of them students — before government troops ended the siege. The massacre of innocent children horrified a country already weary of unending terrorist attacks. Pakistan's teenage Nobel Peace laureate Malala Yousafzai — herself a survivor of a Taliban shooting — said she was "heartbroken" by the bloodshed. Even Taliban militants in neighboring Afghanistan decried the killing spree, calling it "un-Islamic." If the Pakistani Taliban extremists had hoped the attack would cause the government to ease off its military offensive that began in June in the country's tribal region, it appeared to have the opposite effect. Prime Minister Nawaz Sharif pledged to step up the campaign that — along with U.S. drone strikes — has targeted the militants. "The fight will continue. No one should have any doubt about it," Sharif said. "We will take account of each and every drop of our children's blood." Taliban fighters have struggled to maintain their potency in the face of the military operation. They vowed a wave of violence in response to the operation, but until Tuesday, there has only been one major attack by a splinter group near the Pakistan-India border in November. Analysts said the school siege showed that even diminished, the militant group still could inflict horrific carnage. A 14-year-old, Mehran Khan, said about 400 students were in the hall when the gunmen broke through the doors and started shooting. They shot one of the teachers in the head and then set her on fire and shouted "God is great!" as she screamed, added Khan, who survived by playing dead. From there, they went to classrooms and other parts of the school. "Their sole purpose, it seems, was to kill those innocent kids. That's what they did," Bajwa said. Of the 141 people slain before government troops ended the assault eight hours later, 132 were children and nine were staff members. Another 121 students and three staff members were wounded. The seven attackers, wearing vests of explosives, all died in the eight-hour assault. It was not immediately clear if they were all killed by the soldiers or whether they blew themselves up, he said. The wounded — some still wearing their green school blazers — flooded into hospitals as terrified parents searched for their children. By evening, funeral services were already being held for many of the victims as clerics announced the deaths over mosque loudspeakers. The government declared three days of mourning for what appeared to be Pakistan's deadliest since a 2007 suicide bombing in the port city of Karachi killed 150 people. "My son was in uniform in the morning. He is in a casket now," wailed one parent, Tahir Ali, as he came to the hospital to collect the body of his 14-year-old son, Abdullah. "My son was my dream. My dream has been killed." "I saw children falling down who were crying and screaming. I also fell down. I learned later that I have got a bullet," he said, speaking from his hospital bed. Another student, Amir Mateen, said they locked the door from the inside when they heard the shooting, but gunmen blasted through anyway and opened fire. Responding to the attack, armored personnel carriers were deployed around the school, and a military helicopter circled overhead. A little more than 1,000 students and staff were registered at the school, which is part of a network run by the military, although the surrounding area is not heavily fortified. The student body is made up of both children of military personnel as well as civilians. "It's a kind of a message that 'we can also kill your children,'" said Pakistani analyst Zahid Hussain. In a statement to reporters, Taliban spokesman Mohammed Khurasani claimed responsibility for the attack, saying it was retribution for the military's operation in nearby North Waziristan, the northwestern tribal region where the group's fighters largely have been based. "We targeted their kids so that they could know how it feels when they hit our kids," Khurasani said. He said the attackers were advised not to target "underage" children but did not elaborate on what that meant. The attack raised the issue of whether this was the last gasp of a militant group crippled by a government offensive or whether the militants could regroup. Hussain, the Pakistani analyst, called the attack an "act of desperation." The violence will throw public support behind the campaign in North Waziristan, he said. It also shows that the Pakistani Taliban still maintains a strong intelligence network and remains a threat. The attack drew swift condemnation from around the world. U.S. President Barack Obama said the "terrorists have once again showed their depravity." U.S. Secretary of State John Kerry added: "The images are absolutely gut-wrenching: young children carried away in ambulances, a teacher burned alive in front of the students, a house of learning turned into a house of unspeakable horror." Prime Minister Narendra Modi of India, Pakistan's longtime regional rival, called it "a senseless act of unspeakable brutality." "My heart goes out to everyone who lost their loved ones today. We share their pain & offer our deepest condolences," Modi said in a series of tweeted statements. U.N. Secretary-General Ban Ki-moon said it was a "an act of horror and rank cowardice to attack defenseless children while they learn." The violence recalled the attack on Malala Yousafzai, who was shot in the head by a Taliban gunman outside her school in the Swat Valley for daring to speak up about girls' rights. She survived to become a global advocate for girls' education and received her Nobel Peace Prize last week, but has not returned to Pakistan in the two years since the shooting out of security concerns. "Innocent children in their school have no place in horror such as this," the 17-year-old said. "I condemn these atrocious and cowardly acts." Santana reported from Islamabad. Associated Press writers Asif Shahzad in Islamabad, Munir Ahmed in Peshawar, Ishtiaq Mahsud in Dera Ismail Khan and Danica Kirka in London contributed to this report.